Thoughtlessly picked up a small bottle and poured, thinking it was Cognac. First sip disabused me of that notion. Now I was beginning to think properly as this smooth liquid with a different flavour to what I had expected spread across the palate. Then I remembered. I had acquired a couple of samples of Longueville House Irish Apple Brandy and everything fell into place, a very comfortable place indeed. This regular Blas na hEireann winner is a favourite of mine. Normandy doesn’t want us to use the word Calvados here. And I wouldn’t want to do it either. I have from the start, maintained that Longueville is better, on a higher level, both in terms of flavour and smoothness, than the French drink. And this inadvertent tasting again confirmed that for me and it is now my Taste of the Week. This is a small batch apple brandy from the 500 acre estate near Mallow. 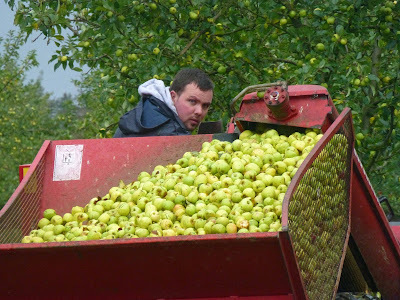 They grow the fruit and make their lovely cider. This is then double distilled in very small stills and matured for four years in French Oak. And the result is this beauty with a lingering finish to savour and enjoy. Good time of the year to stock up on it! 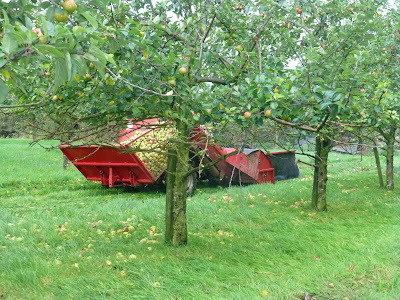 Longueville has 25 acres of apples and the orchard is over 20 years old. “We don't spray Roundup here,” proprietor William said. “We try to stay away from them. No pesticides.” One way they counter the aphids, a tiny bug that can do enormous damage, is to encourage the hoverfly by planting the likes of Fennel, Angelica and Yarrow. These attract the hoverfly, a natural enemy of the aphid. Sheep are normally kept in the orchards and they ensure a low level of grass. But they do have to be taken out immediately before and during the harvest. 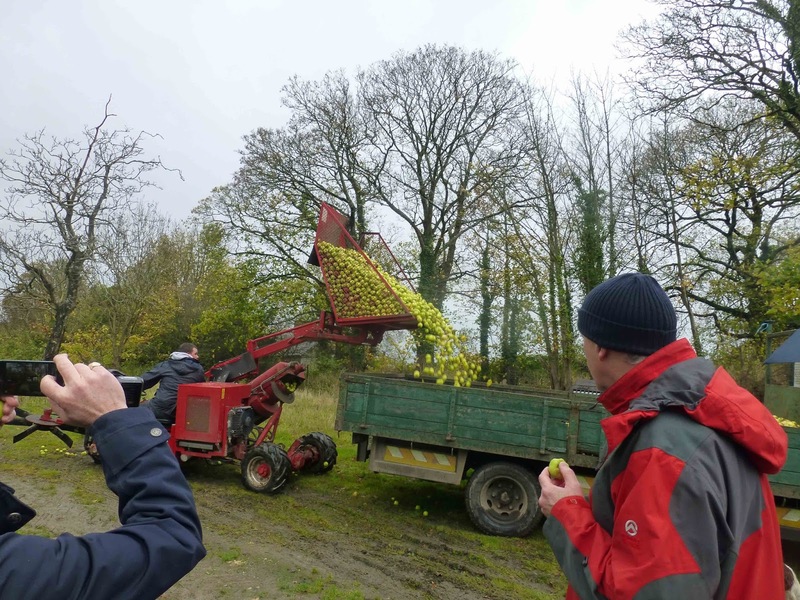 To read more about Longueville cider and brandy, please click here. Happy Apple Time In Idaho. She Said Apple Brandy. Not Bramley! Apple Time in Idaho Café. Well, apple time all over the country. Just check out Mealagula Orchard’s stall in the English Market and sink your teeth into those delicious Katie, maybe cook up a tart with the Bramley. 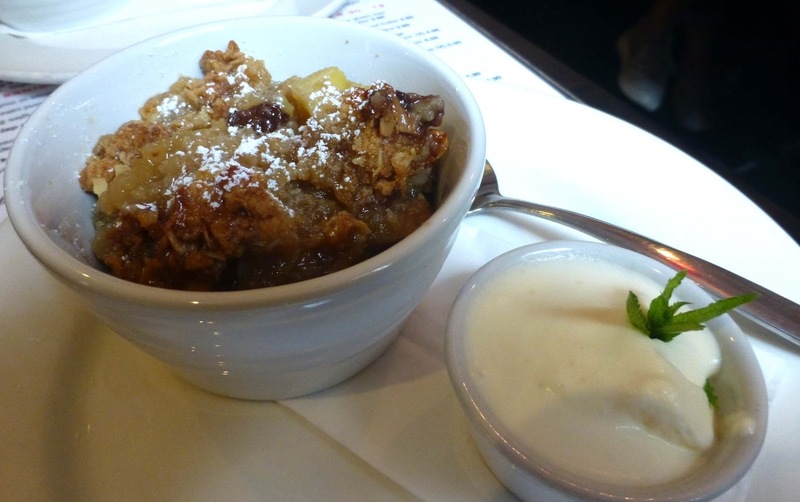 And if you want the very best Apple Crumble, ever, head on over to sunny Idaho. Maybe the sun doesn't always shine outside on the tiny terrace but it never fails inside. The warm welcome is a given and you’ll get all the info on the day's specials without even asking. And our server was just delighted to tell us about the Crumble. She and the rest of the crew had been knocked out by the aromas earlier in the morning and were just about restraining themselves from scoffing it all. It was an easy sell. First I thought I heard Bramley but, no, it was apple brandy that the raisins had been soaked in. The deep dish was packed with the moist apple and crumble. It may not make the prettiest of pictures but, with a little dollop or two of cream, it is a magnificent dessert. And the good news is that there’ll be plenty more of it. 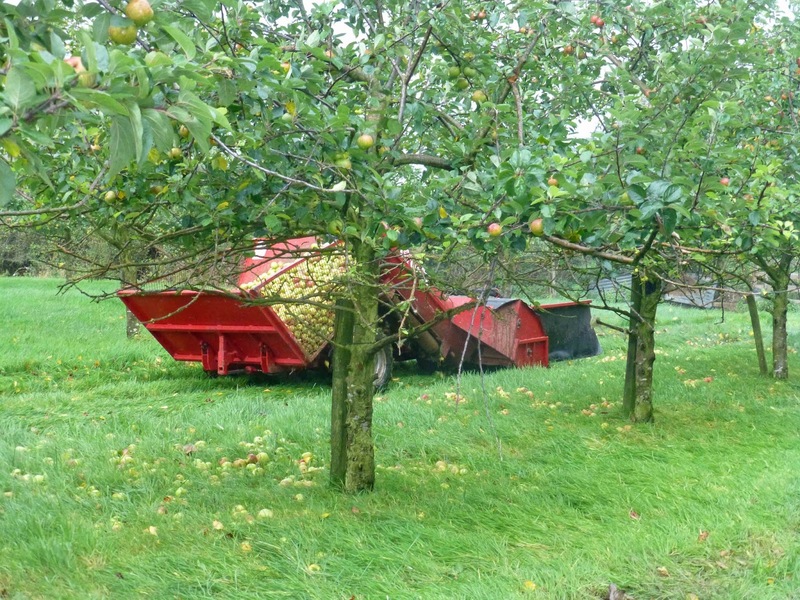 The Jacobs, Richard and chef Mairead, have their own orchard at home. You can't get more local than that and you'll be hard pressed to find a more delicious crumble (just managed to type that as a half-hearted-kick in the shins was delivered by the official blog cook!). 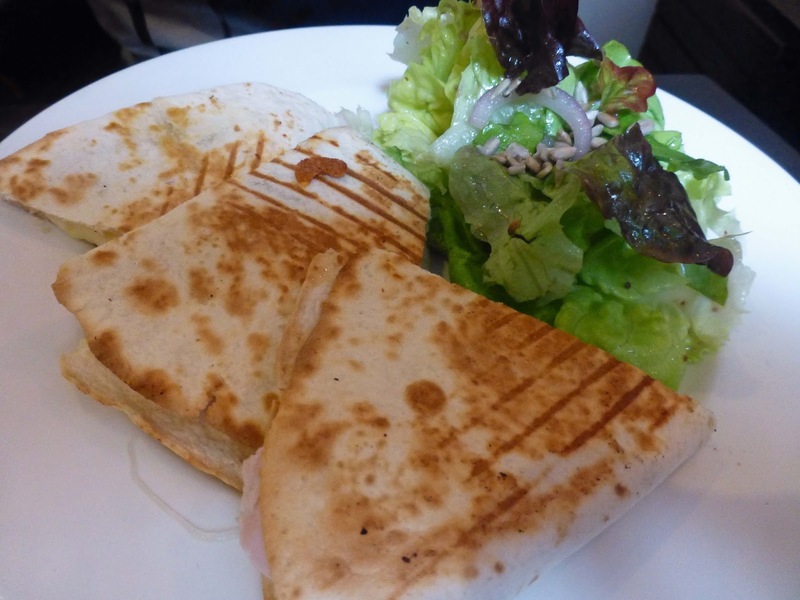 The popular city centre café is just a hop, skip and a jump from Patrick Street, at the rear of Brown Thomas. 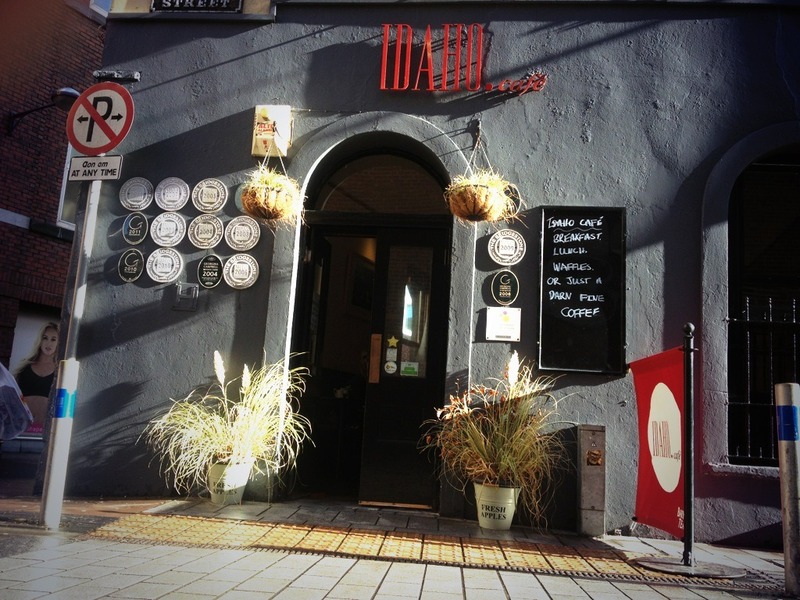 It is small and often full, whether for breakfast (from 8.30) or lunch, or for coffee and “hippy teas” (and crumble!) anytime. I had been half-hoping that the salad Niçoise they had for the Cork Bounty Week was still on but no such luck! So I picked the Blackened chicken salad. 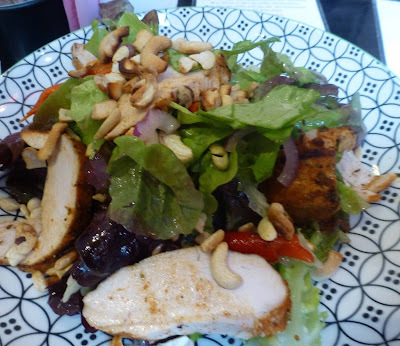 Another superb dish, the chicken was moist and tender, cooked to perfection, the salad fresh, crisp and well dressed, the nuts giving it a welcome crunch. Delicious. 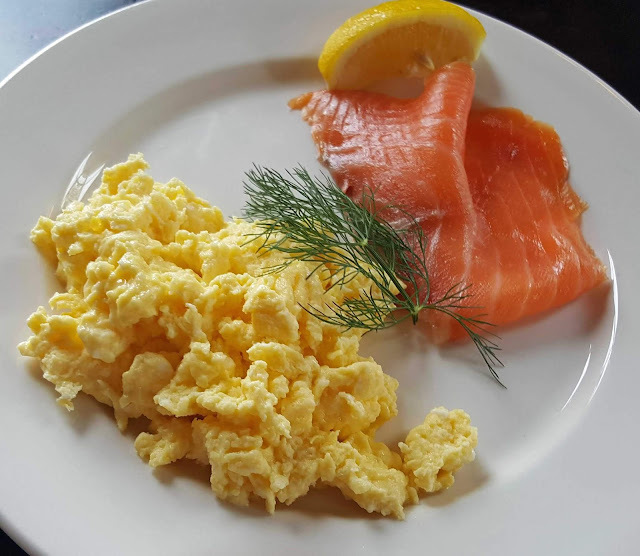 Produce is the best of local, cooking is fab, service is friendly, prices are fair (34 euro for two mains, two desserts, two Americanos; add €4.95 for a glass of Kelly’s Patch Chardonnay). By the way, they only use Irish meats, fish, poultry, dairy, and eggs. “Not just because they are the best, but because we believe in Ireland.” And I believe in Idaho! Join up. Just Ireland's Best Café 2013. 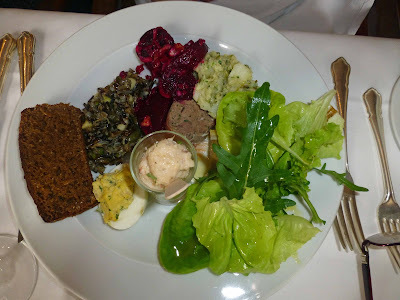 The dishes at Sunday evening’s supper in Electric South Mall had unusual pairings: the ciders and apple brandy from Longueville House, presented by Rupert Atkinson who surprised many with his declaration against ice in your cider! “No ice! It waters down the flavours and kills the carbon. Enjoy this like a wine, in a wine glass.” So we sipped this naturally cloudy cider and we did enjoy it very much indeed with our starter: Butternut Squash Salad (with Roast Red Peppers, Crumbled Feta, and Spiced Peanuts). There was a big welcome from Rupert as we arrived and he soon had us seated with a tall glass of Cider Sangria in our hands. Outside, summer hadn't quite broken through as forecast but inside we enjoyed this very refreshing drink. As the mains were being served, the Longueville House man introduced us to their Cider Mór, aptly named as the ABV here is 8%. He explained that a little apple brandy has been added to this limited edition. Again no ice but you may serve it straight from the fridge. It should do well with the fish and chips and it did. Many of you will know that the Electric version of Fish and chips is an excellent example; the fish is not smothered in batter. Oh yes, they do use a batter and Sunday's was featherly light and the delicious fish was immediately apparent, not hard to find in a large pocket. The full description: Cider & Dill Battered Hake, Leek and Pea Purée, Chips and Tartare Sauce. We would finish with a flourish. Hegarty’s Cheddar was paired with the Longueville House Apple Brandy. “This is made in Whitechurch and is one of Ireland's best cheeses”, said Rupert; it was served with apple, relish and crostini. 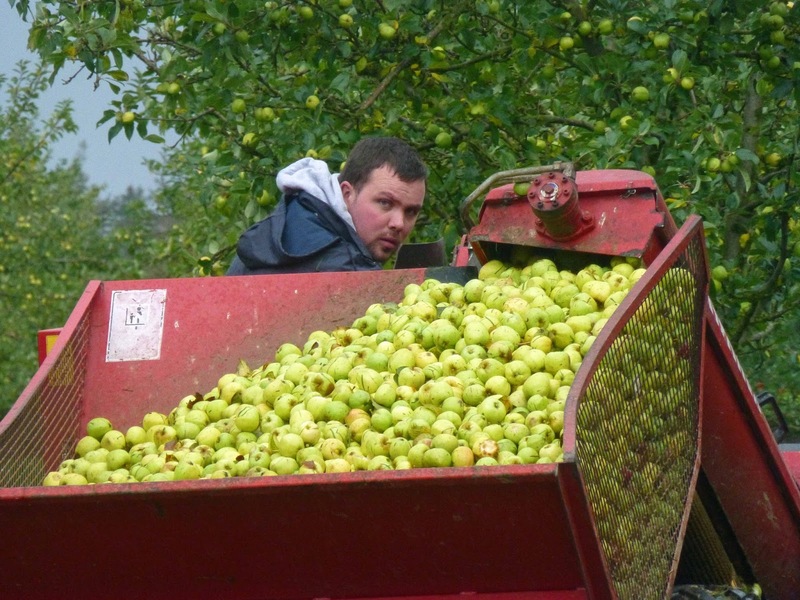 Like all the ciders, the brandy comes from apples grown in the orchards of Longueville. We enjoyed the 2009 vintage and it was quite a while in the making. Its story started with the 2006 apple crop. Three years later, the cider is doubled distilled and then the brandy spends a minimum of four years in French red wine casks. “No mixer needed,” Rupert emphasised. “It is very smooth, no burning and good for digestion, best after a good meal. If it feels a little cool, just warm it in the palm of the hand.” So lots of good advice, good food and good drink all added up to a very enjoyable evening at Electric. Click here to read all about my visit to Longueville House and its orchards last autumn. It is a big country house. And the fire is on. Not just to warm the building and its hosts and guests. But to cook your lunch. Don't worry, that big haunch of lamb will be ready in time. 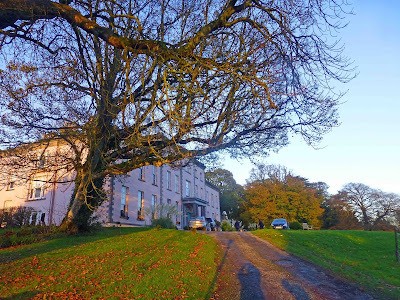 Welcome to Longueville House. 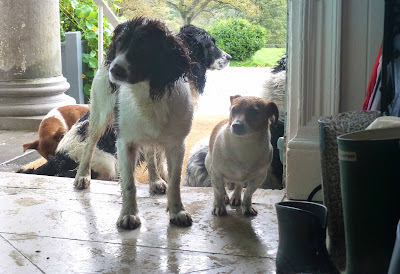 The welcome begins at the front door where an engaging posse of rascally dogs, all well behaved, snuggle up to their visitors. Once indoors, you are warmly welcomed by Aisling and William O’Callaghan. 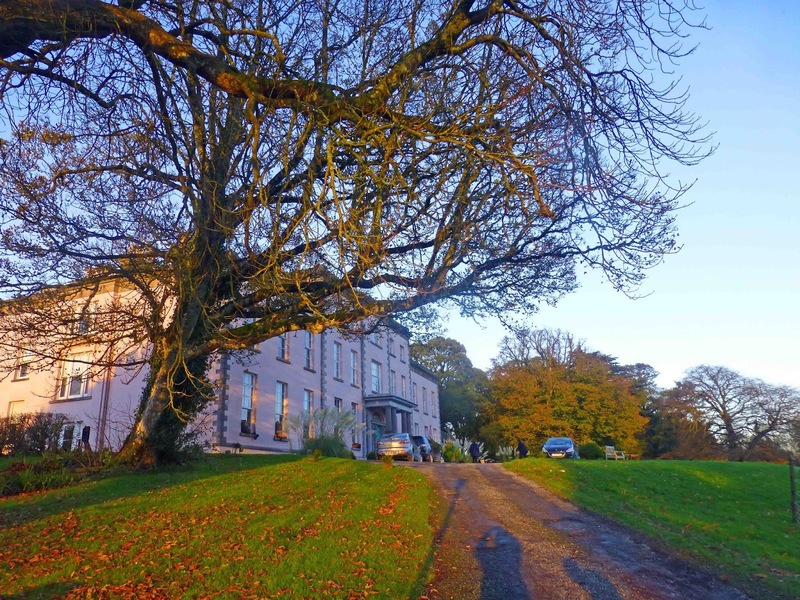 Their house, the central block of which was built about 1720, stands in a 500 acre wooded estate, and on a rise over the Blackwater Valley. Sunday lunch here is a legendary leisurely affair, the rush of the 21st century left behind when you turn off the Mallow-Killarney Road. It is highlight after highlight in the relaxed dining rooms. 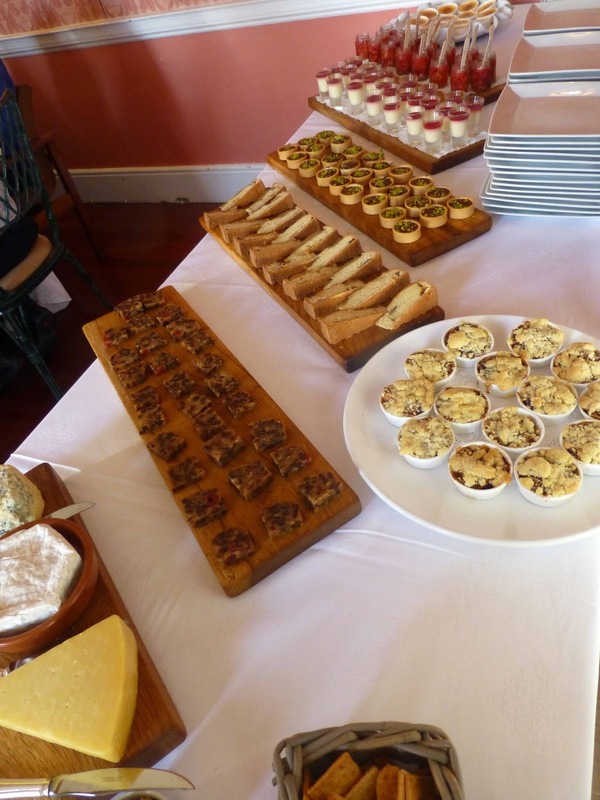 The first thing that catches your eye is the Appetiser Buffet. Could be a rush here! But, no. All is well organised. The staff organise the flow and there is never anything approaching a queue, just a line of five or six, moving smoothly along and getting any information they need from the helpful staff at the buffet. The buffet can change from time to time of course. Here is last Sunday's selection: House patés, House smoked fish, Longueville Pork Sausage in puff pastry, Egg mayonnaise, Potato salad with Garden herbs, Seasonal salads and pulses, Garden leaves, Garden fruit chutney, Homemade mayonnaise, Herb infused vinaigrette, various breads. Take your pick! 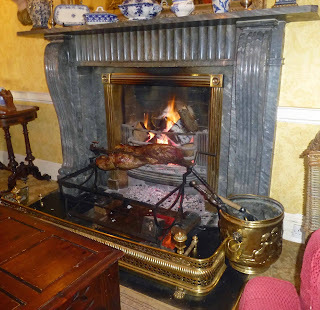 Leg of Longueville lamb cooked over an open oakwood fire, sausage of braised shoulder, garden thyme sauce. Pan fried fillet of Cod, Longueville House cider, tomato and chervil velouté sauce. Garden Pumpkin pithivier, baby garden vegetables, sorrel pesto. 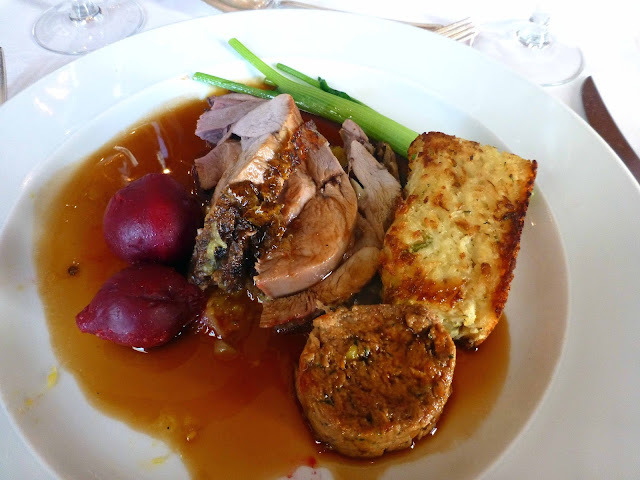 The lamb, accompanied by a selection of vegetables and potatoes from the garden, was superb, full of flavour from “lands as beautiful and fertile as any in Ireland”. Our gaze though turned from the distant valleys and hills, now lit by the sun after heavy rain of the morning, to a table to my right when dessert was announced, another buffet, another irresistible selection. And, after all that, tea or coffee at your table or in one of the nearby rooms. Just relax and linger awhile. And, if you feel like it, take a walk, a short one or indeed a long one. I had come with a group from the Munster branch of the Irish Wine and Food Society and we had a walk that morning, guided through the orchards by William himself. 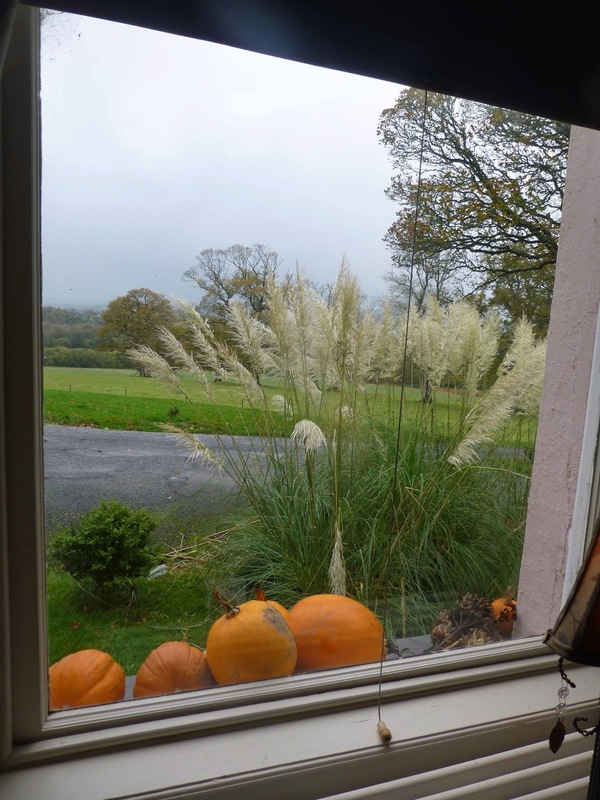 The harvest was in full flow and would go on right up to Christmas. It is a late one this year, three weeks behind normal. There are 25 acres of apples and the orchard is 20 years old. “We don't spray Roundup here,” William said. “We try to stay away from them. No pesticides.” One way they counter the aphids, a tiny bug that can do enormous damage, is to encourage the hoverfly by planting the likes of Fennel, Angelica and Yarrow. These attract the hoverfly, a natural enemy of the aphid. Sheep are normally kept in the orchards and they ensure a low level of grass. But they do have to be taken out immediately before and during the harvest. I began to wonder about the meat cooking below in the house! Soon though we were back in the buildings and in the crush house where the process of making cider, and eventually apple brandy, starts. We met Dan the distiller and he handed out samples of raw brandy, starting from the still. That warmed us up! Then we had a “proper” tasting with William and Dan. We started with the now well established award winning Longueville House medium dry cider. More recently they have launched Longueville Cider Mor which has a more robust ABV of 8 per cent, “a bit like a Bordeaux superieur” someone observed! 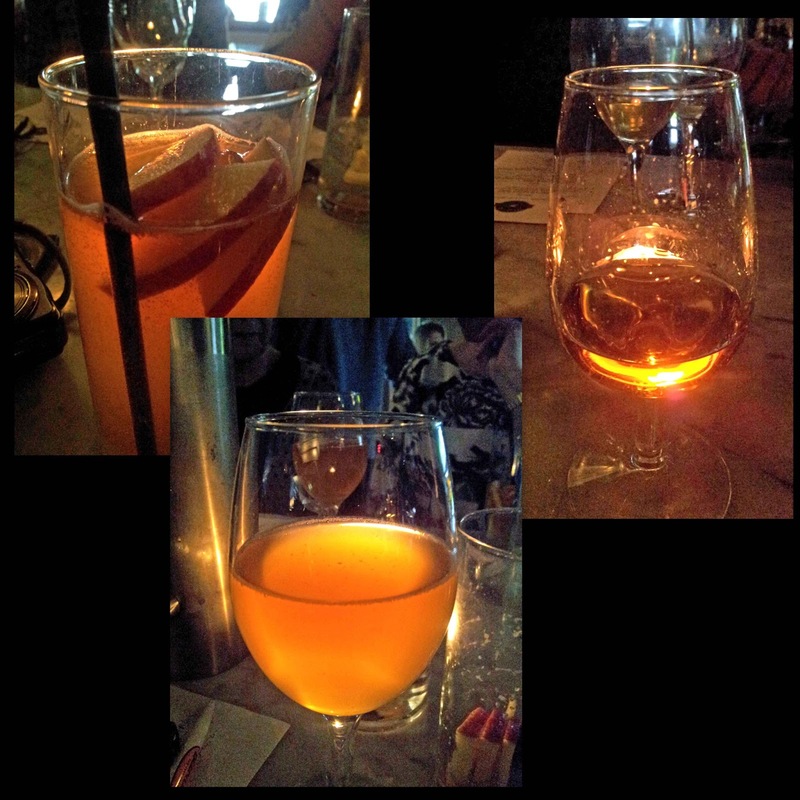 And then we sampled the apple brandy, a really serious drink and another award winner. Back at the house itself, we were welcomed in from the rain with a glass (or two) of mulled cider, a superb drink, quite a few saying they'd prefer it to mulled wine and I concur. After that it was time for that leisurely and lovely lunch. A terrific venue and Very Highly Recommended. 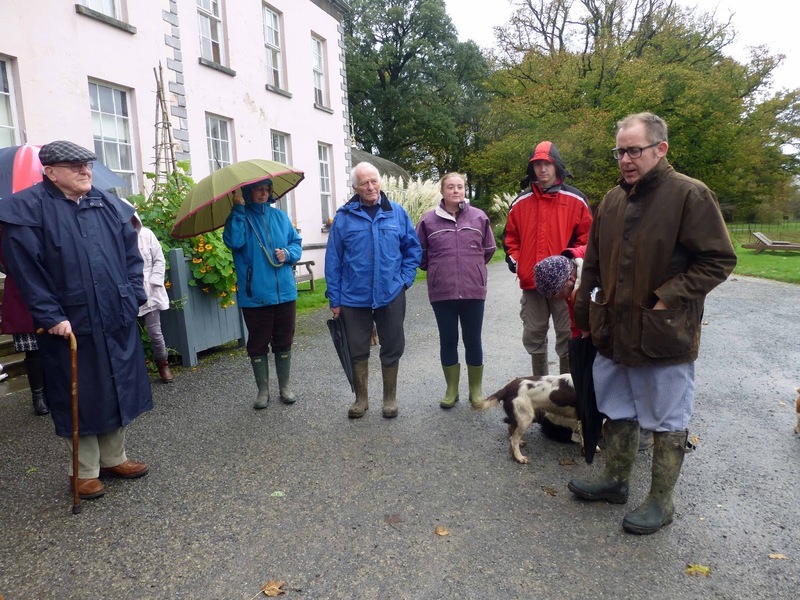 William (right) speaking to some of his guests last Sunday.